Wandering the cities of Greece, tourists and locals alike can’t help but notice the amazing art sprinkled throughout the streets. From graffiti-style tags, to incredibly delicate portraits, and everything in between and beyond, the street art in Greece is a major point of pride. While some artwork is commissioned and some of it isn’t, what results is a vast mixture of styles and imagery, making the artwork even more exciting. Street art (and, of course the street food) is one of our favorite things to see when we go back home. It only makes sense that we’d bring in the element of Street Art to GReKo. 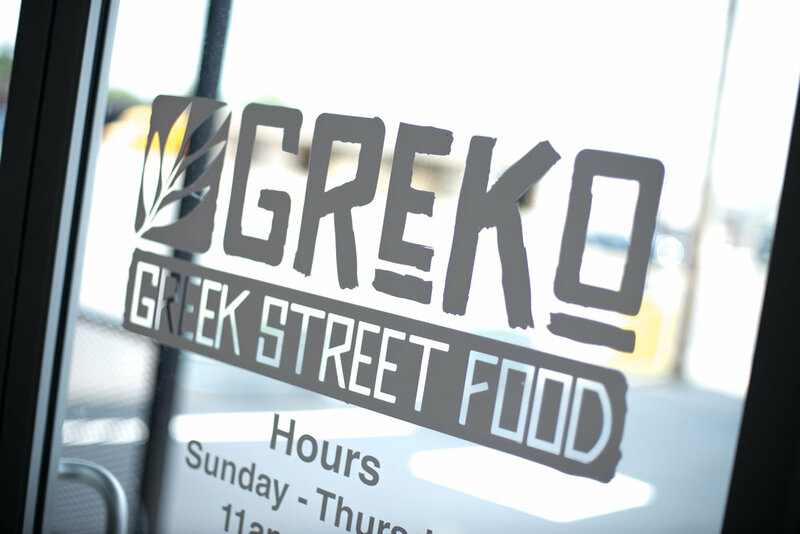 We couldn’t think of any better way to make GReKo feel as authentically Greek and authentically "street" as possible. Eric “Mobe” Base is a local Nashvillian-turned-Floridian who came back here to the “Athens of the South” to play a major role in making GReKo feel appropriately Greek street. Using just spray paint and a few sketches and ideas from Tony and Bill, Eric brought the vision for GReKo street art to life. Filled with references to Greece and Greek Mythology, our GReKo street art, paired with our street food, will surely transport you to the Mediterranean country we love so much. Mythological references fill the interior of our space, with the great Poseidon fighting a massive octopus near the front of the dining area, and the powerful goddess of wisdom and war, Athena -- the muse of Nashville’s Parthenon, no less -- near the back door that leads to the patio. Art buffs may even notice similarities between our Athena and Botticelli’s Venus from his famous piece, “Birth of Venus,” as she was Mobe’s inspiration for creating GReKo’s muse. Out back in the courtyard, much of the art directly pays homage to Greece: the owl is the symbol of Athens and the Greek letters “ΑΘΕ” (alpha theta epsilon) are commonly associated with the emblems and symbols of Greece’s capital city. The pigeons simply reference the abundance of the pesky birds that are seen all throughout Greece, however our painted versions promise to be far less annoying while sharing food and drink with friends! Don't bother feeding them. Possibly our favorite piece from Mobe is his interpretation of a dancing Greek man, a piece which stretches across almost the entire back wall of the courtyard. With a cigarette in his mouth, arms outstretched in the classic “let’s dance” stance, and the old-timey vibe in which he was created, this piece really feels Greek. We just hope it will inspire you to get up and dance, too! With the art on the walls, construction moving along, and menus being finalized, we are increasingly anxious about opening our doors to share a meal with you in just a few months!